I was recently down in London, Ontario for business. I had some free time in the evenings, so I decided to check out a few of the area cruise nights and do some car spotting. South-Western Ontario seems to be an area that is loaded with old American Iron, and every time I travel there I come across something new. On this trip, when I ventured south of London, I came across this 1971 Vista Cruiser parked outside a small town local garage. As a rounded a corner, I caught a glimpse of the front end of this marvellous Olds and I instantly came to a halt for further inspection. The car is unplated, and it appears to be used as an advertisement for the garage. I’d say it works, as it sure grabbed my attention! I was able to get some decent shots with my phone, unfortunately none of the interior shots came out. The interior did match the exterior though, original looking with just a smidge of patina. The Oldsmobile Vista Cruiser was based on the intermediate Cutlass, but had a 5” wheelbase stretch, all of which went in the rear passenger/cargo area. The 1968-72 models rode on a full-size like 121” wheelbase. The longer wheelbase moved the rear axle back allowing room for a forward facing seat to have a proper foot well. The Vista Cruiser was available as a 2 or 3 seat wagon, and this particular example is a 3-seat. A more detailed history can be found here or here. Not only did the wheelbase stretch increase the passenger room, but it also made a significant increase in the cargo room. The 1971 Oldsmobile Cutlass Cruiser had 93.6 cubic feet of space, while the Vista Cruiser had a whopping 105.2 cubic feet of cargo space. In fact, it wasn’t far off the massive 1971 Custom Cruiser, which GM measured at 109 cubic feet of space. Although based on an intermediate chassis, I think it’s hard to argue these cars were midsized. The 1971 Vista Cruiser stretched out to 218.3 inches in overall length, and GM claimed that the curb weight was stout 4283 lbs (probably more in real world). The Oldsmobile Cutlass line was heavily restyled in 1970, including the Vista Cruiser, although its bones date back to 1968. Like the rest of the 1970 Cutlass line, the Vista cruiser received new quarter panels with a sweeping character line over the rear fender. The front clip was restyled, the lower body character line was eliminated and the dashboard was revised. For 1971, the Cutlass line received a new hood with two large muscular looking bulges, along with larger grilles to fill those bulges. The engine choices were a 350-2bbl, a 455-2bbl or a 455-4bbl, all of which had lower compression for 1971 to run on regular gas as per the corporate wide GM mandate. Since this was a 1971, the VIN does not show the engine displacement and I was unable to determine what was under the hood. With the drag racing sticker on back, maybe it was the 455-4bbl? This particular example has almost the perfect amount of patina. As someone who has battled rust for my entire car owning life, I have never particularly cared for any rust, patina or otherwise. 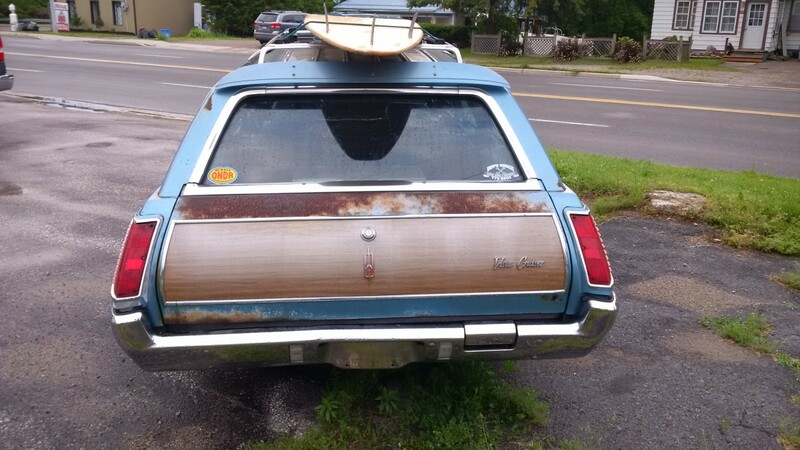 However when I saw this fine specimen, I had to admit that the patina, the vintage looking business logo on the rear window and the surf board on roof looked pretty darn good. So good, I’d almost be tempted to keep it like this and just drive it if it were mine. It certainly was an original or mostly original car, so why change it? On closer inspection though, the Di-Noc was hiding some significant rust on the lower doors and the fenders, to the point of requiring major surgery. And as quickly as my new found love for rust patina came, it was gone. Nightmarish thoughts of cutting sheet metal and finding more and more rust filled my head. No thanks! Then again I realized it’s not my problem to deal with and I quickly returned to admiring the car. Sitting here on the side of the road this old Olds just put a smile on my face. Growing up, I had a neighbor with a green ’72. Somehow that thing still looked great even after 10 or 12 Michigan winters. Banish rust! Conserve CC Vistas! Great find. 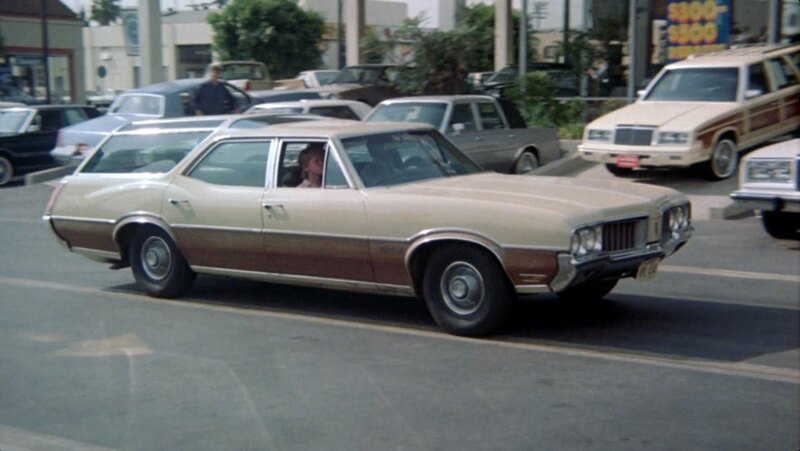 I think the Olds wins over the Buick because the woodgrain solution was better than the sweepspear version. I’d take either though, rust n all. 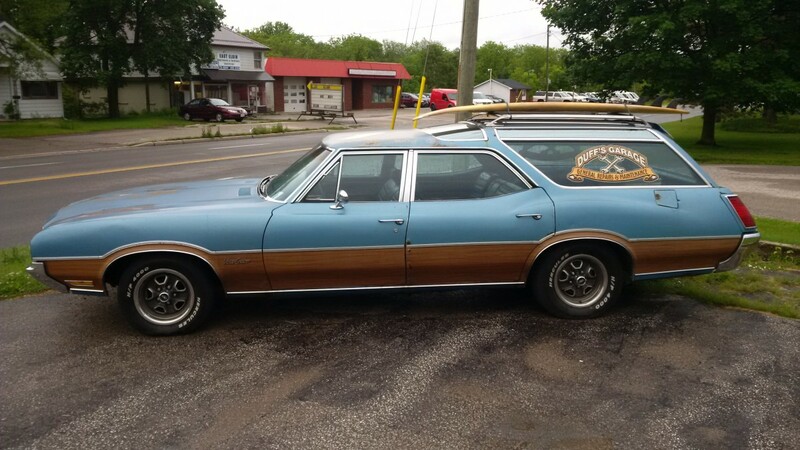 Oldsmobile didn’t offer a full-sized wagon between 1965 and 1970, which is probably one of the reasons their “intermediate” wagon of this era needed to be so large. 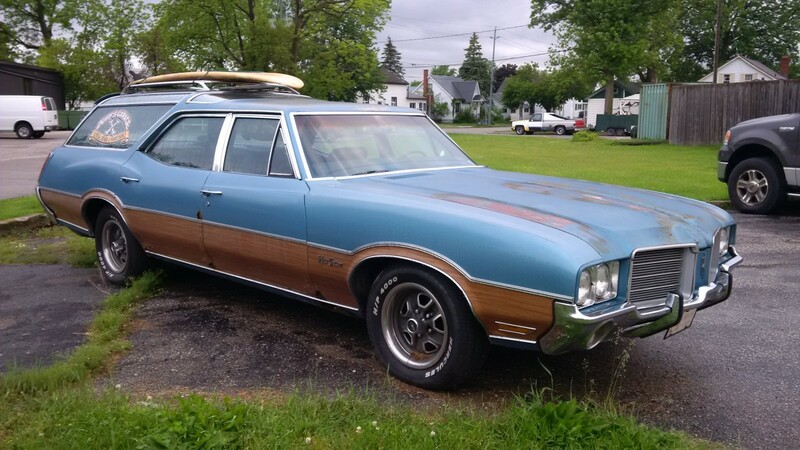 The Olds A-body lineup included both a regular Cutlass wagon on a standard 116″ wheelbase, and the Vista Cruiser on the stretched 121″ wheelbase. The Vista Cruiser was definitely intended to serve as the full-size wagon in Olds’ lineup; as you noted, there was no “true” (B-body) full-size wagon. Buick also did something similar during the same era. The ’66 Vista Cruiser article and its discussion, linked above, have more details on these cars, and some theories on why GM did things this way, and why they later stopped. The Vista-Cruiser (and Buick Sportwagon through 1969) was nearly the size of a full-sized Chevrolet wagon in every dimension except width – and even had a 1-2 inch longer wheelbase than the big Chevy hauler through 1970. The first-gen VC/SW (1964-67) also shared the engineering shortcomings of other GM intermediates such as small 9.5-inch brake drums (discs became an option in 1967) and 2-speed automatic transmissions along with only small V8 engines in the 300-340 cid range, a combo not very good for heavy-duty trailer towing (5,000 and up) – for that you had to upgrade in size to a full-sized Pontiac or Chevrolet wagon with a bigger V8 (standard on the Pontiac but an expensive extra-cost option on the Chevy) and available Turbo-Hydramatic transmission. The second-gen 1968-72 raised-roof did get larger 350 V8s standard and optional 400 or 455 engines and the 3-speed Turbo-Hydramatic transmission along with optional (later standard) front disc brakes and other improvements but even those wagons were still intermediate in size and engineering components and with all 4 divisions now having standard-sized wagons by 1971, GM determined there was no longer a need for the stretched-wheelbase, raised roof mid-sizers so they were dropped when the Colonnade intermediates debuted for 1973. We’re still driving these of course. The automakers just had to add lots of ground clearance and ride height. I can’t see one of these without thinking of “That 70’s Show”. 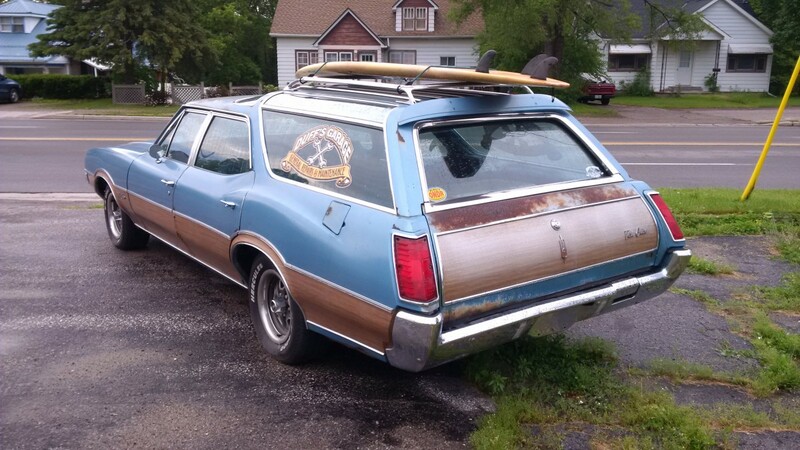 Nice Olds, the surfboard is an ironic touch, since there is zero surfing available in Aylmer, Ontario. I share your lack of enthusiasm for Di-Noc clad rust. Doug, There actually is surfing in the Great Lakes, a.k.a The North Coast. Maybe the combination of prevailing westerly winds and Toronto’s location on the northern shore of Lake Ontario conspires against surfing there, but I would bet that surfing is likely possible on Lake Superior’s beautiful Ontario shoreline, especially during winter storms. I thought you might enjoy this clip about Lake Erie surfing in Cleveland. Ah, wintertime surfing in Cleveland, brrr! In Cleveland, you have to be tough. Go Cavs! Yup, I’ve seen surfers down by the bridge at Hamilton beach on Lake Ontario’s south shore. I am only slightly tempted, same as Cleveland good waves usually require winter storms. Brrr is right! The Great Lakes are one of the few places to surf where you don’t have to deal with salt water. The waves aren’t any worse than those typically found in my local mid-Atlantic east coast and the water must be cleaner. I think the irony is although Aylmer may be close to the great lakes, it’s just a little town in the middle of farm country. Certianly not where you’d picture finding a surf community. For a small town, it did have a pretty good little cruise night. Nowhere the size of the big one I went to at Steve Plunkitt’s in London, but I was surprised at the number of cars. As you said : rust never sleeps and will always come back, ruining the previously good vehicle . Once the sheet metal is paper thin there’s no going back or saving it . I have a fetish for these Vista Cruisers. I just have these dreams of a cross-America drive in one, with the stereo rockin, the A/C on full tilt, carrying all the luggage we can imagine, as we effortlessly blast through the Rockies headed toward California. I, too, am not a fan of patina, rust or rot. Assuming the owner bought the car for advertising purposes, all well and good, for it’s probably too far gone to restore, anyway. Love the Vista Cruisers, though! My kind of wagon. 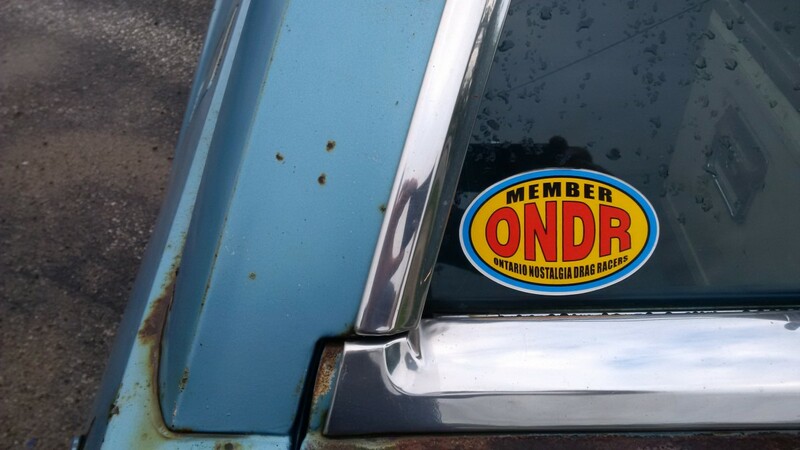 I had the same thought – the car is probably presentable enough to be used as a stationary advertisement, but has rust-related issues that make it not worth restoring or even using as a regular driver. The car wasn’t beyond restoration by any means. It did have some significant body rust on the lower body that would require panel replaement or some metal surgury. And I am sure there was more that I didn’t see. My cursory inspection of the undercarriage showed that it had a fairly solid frame though. This car would be a good car to restore, but I just think once you got into it, there’d be a lot more rust hiding within the car. Today’s SUV’S look like the box that this Olds was shipped in. Hey-it`s no Family Truckster, but it`s cool. Road trip anyone? I also am not a fan of the patina look, at least for the most part, but most of the patina finishes are covered by a clear coat to keep the patina at the exact level achieved, whether by nature or by trickery/artistry. Most patina is patently faked any more, so the chance of it causing more rust is minimal at best. This brings up the point of “earned” patina versus “faked” patina. I respect earned patina, as it means the piece was used (and hopefully loved, instead of abused) and gained the wear patterns via that use. The faked stuff is just going after a look, and if that is your cup of tea, good for you, but it is not for me. I don’t see the point of building or restoring just to make it look like it has not been taken care of. But that is also my issue with most rat rods. If they were built by someone on the cheap, it makes sense, but when a poser pays a builder big money only to make it look like it was built on the cheap, I wonder what is wrong with the world. 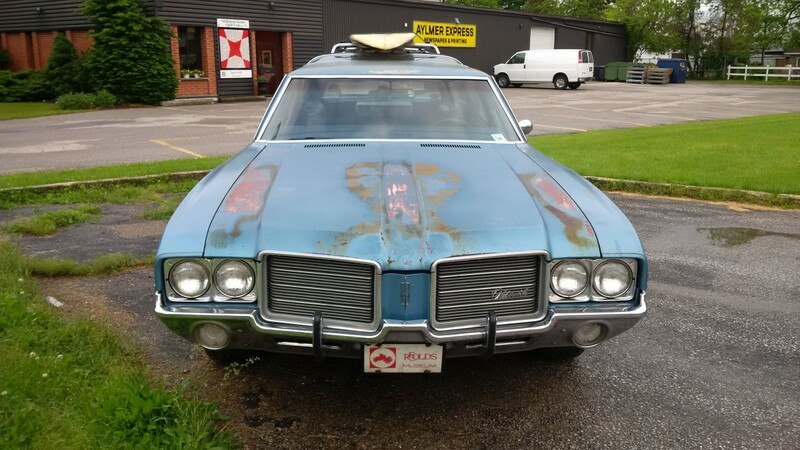 Fortunately I’ll be moving into a place with a garage soon and I’m seriously considering a coating of “patina preservative” for a vehicle that has earned it. This is simply because the vehicle is in driver condition but it will be a long time before I can afford the restoration it deserves. Come to So. Cal. then and see the plain rust taking it’s toll . I’ve begun seeing otherwise good vehicles junked after twenty years of fake patina….. Very few clear coat them, that’s a new thing . I have seen people doing this clear coat over the patina rust. I don’t know, but this sounds like a bad idea to me. In my experience painting over rust, even surface rust, is never a long term solution. Maybe in certain warm dry climates it’d hold up okay (ie Arizona), but I have done enough body work over the years to know, that even with proper prep, primer and paint, the rust still seems to come back given enough time. That is unless it is sandblasted, chemically removed or the rust is cut out completely. The basic ignorance and stupidity of claiming to be an enthusiast then _deliberately_ destroying what you claim to like, that’s what . Thank you kind Sir . This is one of those cars that I never appreciated when they were common but really love now. As a kid, Oldsmobiles were everyfreakingwhere. Having spent my entire life growing up in F-85s and Cutlasses, these were “the establishment” that I was trying to flee. In college there was one of these that lived in the alley behind our apartment. It was in dire need of a new exhaust system. Every morning its owner would fire it up very early to go to work and it woke me up every time. Not cool for the guy who didn’t come in until the wee hours back then. But now? I see these as unique and fascinating cars, the kind of stuff that only GM could do, a special model not duplicated all across the model line. With age sometimes comes wisdom . 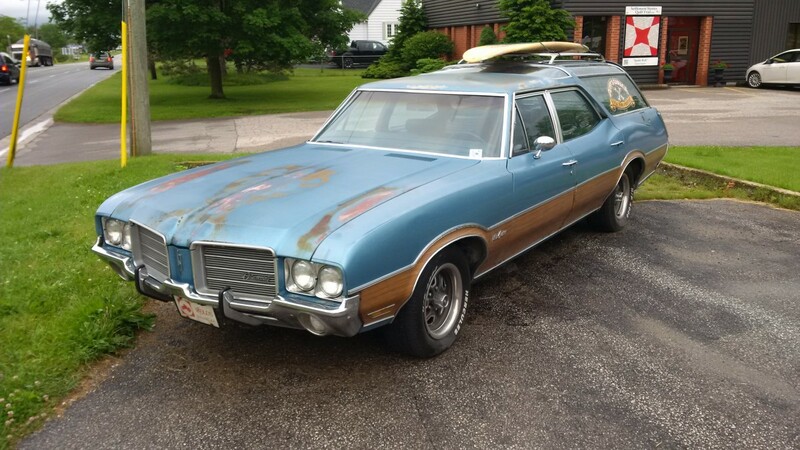 I believe that it was a Vista Cruiser of this vintage that met the crusher when Clark Griswold traded it in for the pea green Wagon Queen Family truckster in the original Vacation movie. 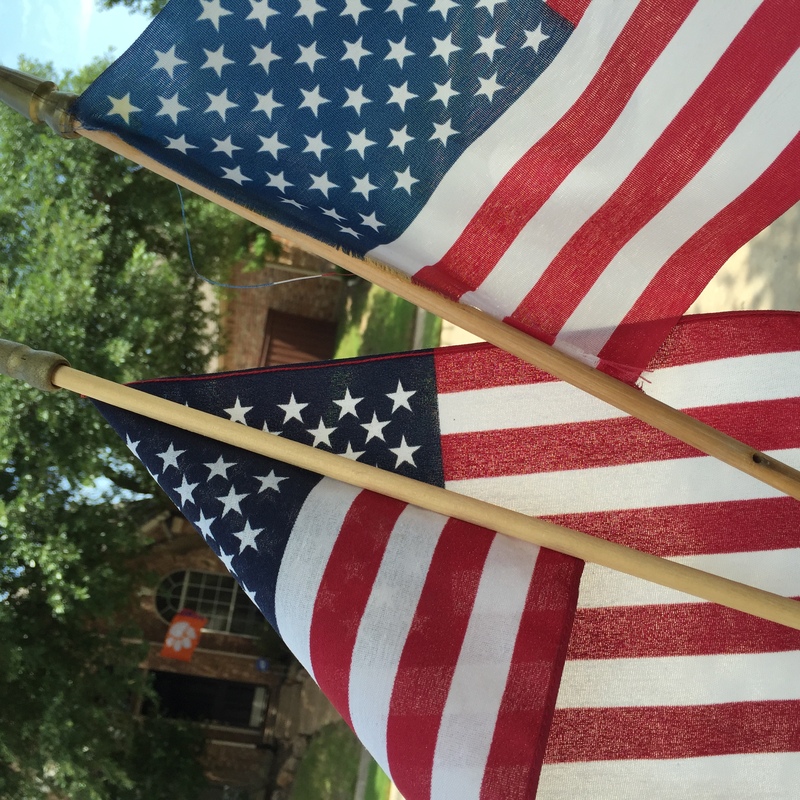 Clark: say goodbye to the old gas guzzler Russ. I may be wrong but I don’t think the 455 was available with a 2 bbl carburetor….I know the 350 came in both 2 and 4 bbl but pretty sure the 455 only came with a Rochester progressive 4bbl….I know this is a fact for all Buicks. Buick and Olds engines were totally different back then. The Olds L30 455 did us a two-barrel carb. As Paul already stated, the 455 Oldsmobile was available with a 2bbl carburetor, just like the 425 that preceded it. The Olds 455-2bbl was offered from 1968-71, and was the base engine for the Delmont/Delta 88 cars. The Buick 455 was almost always a 4bbl engine, except for 1974, when Buick offered the 455-2bbl (except California). Given your contentious relationship with rust, I invite you to move to Southern California. We really aren’t familiar with the stuff–save the idiots who park their cars on the street overnight in the beach communities. Here, cars actually wear out, they don’t rust out. When my son and I restored his 1968 Mustang, the only rust we found was on the passenger side floor…where a leaking aftermarket sunroof repeatedly soaked the carpet. We replaced a 4 x 4 inch square of sheetmetal. Everything else is as it left the factory…but dirty/greasy. You will love our old cars here! Thanks for the invite to SoCal! I have never been, but do plan to go one day. If I lived in that climate without a winter to contend with, my daily driver likely would be a curbside classic. I have a friend who did a rotisserie restoration on a ’65 Mustang. It had zero rust, abosulutely clean car. Up in snow country we do rarely come across totally rust free cars, but only if they haven’t been winter drive from day one. I sold a battery to the owner of that car last week here in Hamilton, none of us can remember if it had the sign in the windows still. I went out to look because a childhood neighbor had a Vista and I owned a 71 Cutlass S in the 80’s. At first glance I thought it was in great shape but it was definitely a 20 footer when you got close. The guy changed the battery right in the parking lot and it was a 455 2bbl. Small world. I wasn’t sure if it was being driven as it had no plates. But maybe the garage has a dealer plate. I’d expect any car of this vintage in Ontario to be riddled with the rustworm. Shame, this wagon deserves a restoration.